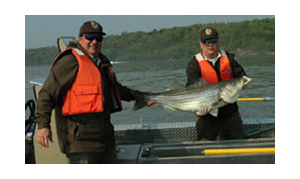 The National Oceanic and Atmospheric Administration (NOAA) and the Pennsylvania Fish & Boat Commission (PFBC) are reminding anglers that a new federal law requires anglers who target or catch shad, striped bass, and river herring from the Delaware River below Trenton Falls or in the Delaware Estuary to register with the National Saltwater Angler Registry. • Are under the age of 16. • Only fish on licensed charter, party, or guide boats. 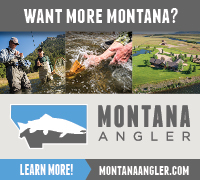 • Hold a Highly Migratory Species Angling Permit. • Possess a New York Marine Recreational License. • Possess a Delaware Fisherman Information Network (F.I.N.) Number. All anglers must still possess a valid state fishing license. Anglers may visit the Registry website at www.countmyfish.noaa.gov and click on the Angler Registry link or call the toll-free registration line at 1-888-MRIP-411 (1-888-674-7411). Anglers will be asked to provide their name, date of birth, address, and telephone number and will immediately receive a registration number. 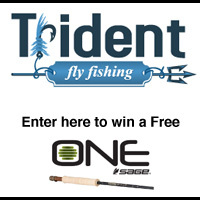 Anglers will receive a registration card by mail in approximately 30 days. It is part of a national overhaul of the way NOAA collects and reports recreational fishing data. The goal of the initiative – known as the Marine Recreational Information Program, or MRIP – is to provide the most accurate information possible. The Pennsylvania Fish and Boat Commission (PFBC) is encouraging local governments, community groups and sportsman’s clubs providing fishing, boating and water safety and aquatic resource education programs to apply for funding through the agency’s Education Grant Program. Grantees can receive up to $5,000 from the PFBC. This funding can be applied to the purchase of equipment, materials and costs associated with field trips. Applications must be postmarked by January 30, 2010. Please visit the PFBC website for more details. The Pennsylvania Fish and Boat Commission recently released the 2010-2014 Strategic Plan for Trout Management. The plan covers 64 pages Pennsylvania's vision, issues and strategic direction for the management of Pennsylvania's trout populations across the state. I wouldn’t call this a good read by any stretch of the imagination, but any angler would appreciate the detail and process the PFBC takes to manage the trout waters across Pennsylvania. I enjoyed many details about the scope and scale of the cold-water resources found in all parts of the state. The Pennsylvania Fish and Boat Commission has been pretty quiet over the last year with news releases. Not sure of the of the reason, but like many things I am sure the economy has something to do with it. Here is a link to the Minutes and Agenda for the upcoming meeting October 5-6. Be sure to keep informed and provide your voice. The one topic of strong interest to many anglers will be the removal of Delayed Harvest Artificial Lures Only Designation on Fishing Creek. Not sure there is much to say, but it would be nice to hear how to resolve this issues in the future and add back to what we have to give up. 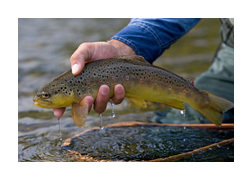 The PFBC will be stocking brown trout into the tributaries of Lake Erie beginning as soon as September 29, 2009. These seven inch long trout will be fin clipped for identification purposes before being stocked the next day. Planned stocking locations are Trout Run, Presque Isle Bay, Crooked Creek, Godfrey Run, and Orchard Beach Creek. All tributary stockings will be done as close to the mouths of each stream as possible as long as there is adequate water flow. If stream flow is low, the fish will be stocked directly into the lake near the stream mouth. Lake Erie Fisheries Biologist Chuck Murray reported that, “The goal of this program is to emulate the brown trout program on Lake Ontario, but on a smaller scale. The intention of this effort is to add some diversity to the tributary fishery, create a near shore springtime fishery and enhance the offshore summer boat fishery. These brown trout stockings will supplant the surplus steelhead stocked since the elimination of the Coho program in 2003. The program was started through the gracious donation of 100,000 certified disease free eggs provided by the New York Department of Environmental Conservation. As the program evolves, the PFBC will develop self sustaining Lake Erie brown trout brood program at their hatcheries”. Fall Trout Stocking 2009...coming soon! 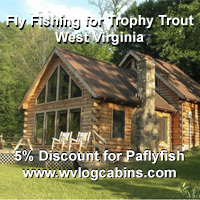 The Pennsylvania Fish and Boat Commission (PFBC) will begin the Fall 2009 Trout Stocking the first part of October. This summer has proven to be fairly cool and wet so the fall stocking should hopefully add to a nice hold over trout population. With this new supply of trout in the streams in Pennsylvania it may be a good chance to try some fly fishing during some of the prettiest times of the year. The PFBC will stock about 100 streams this fall. No official numbers have been announced, but in 2007 about 47,000 trout were stocked. 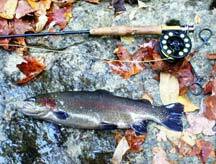 As reported by the PFBC, the mortality rate of the trout stocked in the fall is very high. Only about 5% of the trout stocked in the fall make it through the winter so enjoy them while you can. Fish stocking can be fun to watch and even to help in the effort. Often there is some labor involved in moving the buckets of trout from the stocking trucks to the streams. The stocking reports provide details where and when you can meet up with the PFBC and then follow them out to designated streams to stock the trout. Local chapters of Trout Unlimited usually plan to assist in this process too. Here is the latest Fall 2009 Stocking Schedule. Please check with the PFBC for the latest updates and changes. The Pennsylvania Fish and Boat Commission recently announced a few possible changes to stream classifications. The Commission will consider adding Walker Run, Luzerne County, from the headwaters downstream to the mouth, to the list of Wild Trout Streams. Two surveys found wild brown trout and a Division of Environmental Services’ survey found both fingerlings and multiple year classes. In addition, the Commission will consider removing classification for the special regulation section of Fishing Creek in Columbia County. That section of Fishing Creek is currently designated as a Delayed Harvest Artificial Lures Only section of water. It is speculated this change is due to a new landowner in the area no longer permitting access to the special regulation area along the stream. At this time, the Commission is soliciting public input concerning the above re- designation. Persons with comments, objections or suggestions concerning the re-designation are invited to submit comments in writing to Executive Director, Fish and Boat Commission, P.O. Box 67000, Harrisburg, PA 17106-7000. The next Commission meeting is scheduled for October 5 and 6, 2009. When the Pennsylvania Fish and Boat Commission (PFBC) holds its quarterly business meeting in early October, the newest board member will bring to his first meeting a diverse background in government service, higher education, private sector experience and local conservation. It’s a mix G. Warren Elliott believes will benefit the agency as it develops its next five-year strategic plan. “I have been interested in fishing and boating, conservation and protecting our natural resources for most of my adult life,” said Elliott, a resident of Chambersburg, Franklin County, who took his oath of office last month as one of the Commission’s two at-large boating representatives. “I also have a keen interest in public administration, experience I want to use to assist my fellow commissioners, the agency leaders and their employees as we craft the strategic plan. A walk in the park is free this weekend! Everyone is invited to national parks across the country for the third of three free admission summer weekends. All 391 national parks will offer free admission this Saturday and Sunday, August 15-16. Many park partners, including tour operators, hotels, restaurants, and gift shops, will provide discounts and special promotions to sweeten the deal. Visit http://www.nps.gov/findapark/feefreeparks.htm for more information. Fees for activities such as camping, reservations, tours, or concessions are not affected by the entrance fee waiver. The Pennsylvania Fish and Boat Commission (PFBC) today announced more than $1.36 million in grants to develop and implement projects that benefit fishing, boating, and aquatic resources within the Sinnemahoning Creek Watershed in Cameron, Elk, Potter and McKean counties. The funding is available through a 2007 settlement agreement with Norfolk Southern as restitution for environmental damages from a June 30, 2006, train derailment in rural Norwich Township, McKean County. The accident spilled sodium hydroxide into Big Fill Run, Sinnemahoning-Portage Creek and the Driftwood Branch of the Sinnemahoning Creek.